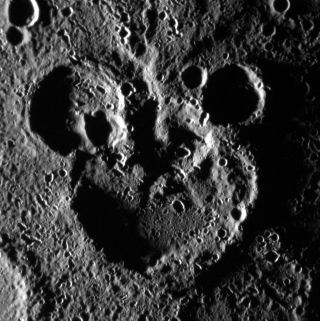 Craters on Mercury appear to form the image of Mickey Mouse. This scene lies to the northwest of the recently named crater Magritte, in Mercury's south. The image is not map projected; the larger crater actually sits to the north of the two smaller ones. Date acquired: June 3, 2012. Forget Pluto, a hidden Mickey Mouse lives on Mercury. A NASA spacecraft has captured a spectacular photo of Mercury craters arranged in a shape that looks just like Disney's iconic cartoon mouse. The photo comes from NASA's Messenger spacecraft in orbit around Mercury and shows a giant crater topped with two smaller impact basins to create the recognizable shape. "The shadowing helps define the striking 'Mickey Mouse' resemblance, created by the accumulation of craters over Mercury's long geologic history," Messenger mission scientists explained in an image description on Friday (June 15). The photo was taken by the Messenger probe on June 3, but was publicly released by NASA on June 15. The Mickey Mouse on Mercury is formed by a huge crater about 65 miles (105 kilometers) wide that was later peppered by other impacts to create the "ears." The scene is located to the northwest of another crater that Messenger scientists recently dubbed "Magritte" in Mercury's southern region. NASA's Messenger spacecraft (its name is short for Mercury Surface, Space Environment, Geochemistry and Ranging) launched toward Mercury in 2004 and arrived in orbit around the planet in March 2011. The $446 million mission was initially aimed at mapping Mercury for one year, but has since been extended by another year.